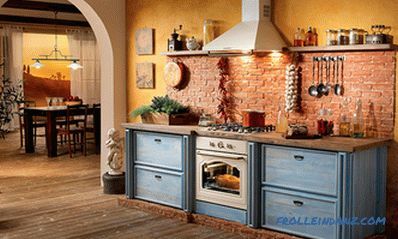 Before choosing a heater for the house, you need to decide on the goals of insulation, what we want to achieve with its help and how far we are ready to go on this way. When planning insulation, it is necessary to focus on the current requirements for thermal resistance of external walling. The main characteristic of heat insulators is thermal conductivity. It shows the ability of the material to conduct heat. The coefficient of thermal conductivity is the power of the heat flux passing through 1 square meter. m obstacles with a thickness of 1 m with a temperature difference on its opposite surfaces of 1 degree. The dimension of thermal conductivity - W / (m · K). λ is the thermal conductivity of the material. The dimension of the reduced thermal resistance is m 2 · K / W. The use here of degrees Celsius (° C) and degrees Kelvin (K) is equally valid. The resistance of the enclosing structures to heat transfer is normalized depending on the climatic conditions, which are expressed by an integral numerical parameter - degree-day of the heating period (GSOS). For definiteness, assume that the insulated house is located near Moscow. For the Moscow Region, the GOSP roundly amounts to 4900 ° С · day with the air temperature in the room being 20 ° С.
windows and balcony doors - 0.52 m 2 · K / W.
Knowing these numbers, we can select thermal insulation materials according to their main quality - thermal conductivity. But before you choose insulation, you need to know how much we are missing to the norm. 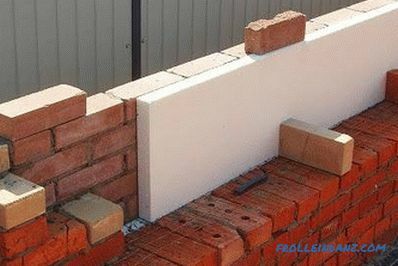 For example, for a brick wall 380 mm thick, we need insulation with a thermal resistance not lower than 2.19 m 2 K / W, since the intrinsic resistance of brickwork of such thickness is 0.93 m 2 · K / W.
The calculations are made for walls of hollow ceramic brick with a density of 1200 kg / m 3 , folded on a “warm” cement-sand mortar and operated in wet conditions. Calculation example: we take as insulation a foam with a thermal conductivity of 0.037 (W / m · K). Multiplying the required additive to the thermal resistance by the thermal conductivity of the foam, we get the thickness we need - 0.081 m. The foam layer with a thickness of 81 mm will provide the necessary insulation. appearance and development mold fungus, which impairs the well-being of people and destroys the wall. Therefore, balancing is very important. The accumulation of moisture in the cold season should be minimized and ensured its unhindered withdrawal throughout the year. Below is a diagram of the cross section of the wall. On it, the temperature and dew point temperatures are very close to each other. There is no condensation, but it can occur when the external temperature drops. External insulation increases the temperature of the wall and in most cases improves the humidity regime. But only if the insulation and lining is sufficiently permeable to steam. The situation is better here, but as the temperature drops, condensate will also appear in the insulation layer. For walls of a multi-layer construction, the rule must be observed - the resistance of vapor diffusion layers should not increase from inside to outside. This is a necessary condition to ensure that moisture does not accumulate in the material. The insulation of the main walls with rare exceptions is done outside. 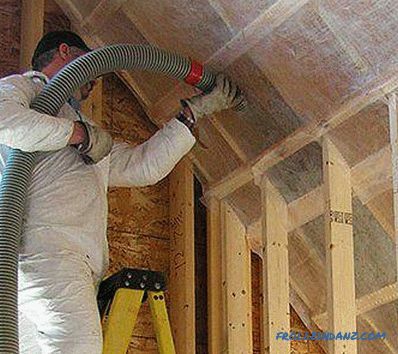 It means that high vapor permeability is required from the insulation. 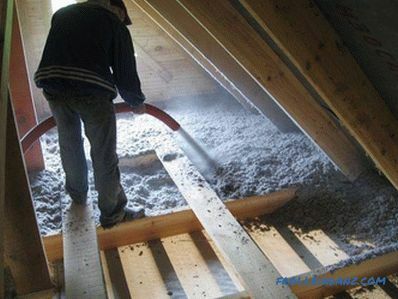 Material with low vapor permeability, such as foam, can cause deterioration of the atmosphere in the house and even the destruction of the walls. Particularly sensitive to moisture wall of wood and concrete (adobe). 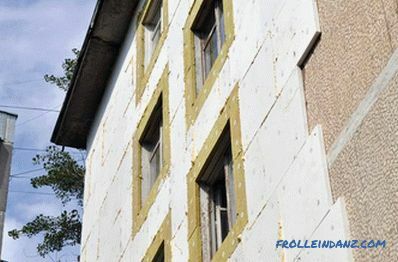 If, in the example above, foam is replaced by mineral wool, there will be no condensate even when the external temperature drops to -25 ° C. And if you use a vapor barrier or a lining with low vapor permeability from the inside, the wall is dry in the most difficult conditions. When deciding whether which insulation to choose in one way or another, it is necessary to take into account not only the thermal conductivity of the materials, but also their permeability to water vapor , as well as the design capabilities of a particular option. Thermal insulation materials are materials whose thermal resistance is more important than strength, frost resistance, and other characteristics. Most heat insulators have a low density due to the fact that in their structure a large volume is occupied by air. It is air that gives them thermal insulation properties. Its thermal conductivity at 0 ° С and normal pressure is 0.0244 W / (m · K), and the closer the thermal conductivity of a heater to this value, the better it is. We make a small overview of the most effective and popular heat insulators. Foam plastics are called different materials, but most often, this is foamed polystyrene, produced without pressure method (EPS). It is produced in the form of plates with a thickness of 20 to 100 mm and has the form of tightly compressed balls, which are relatively easily separated from the total mass. EPS polystyrene has a density of from 10 to 50 kg / m 3 . Air occupies up to 97-98% of its volume, therefore the thermal conductivity of the foam is close to that of air - 0.34-0.4 (W / m · K). It is interesting that the dependence of thermal conductivity on density is non-linear and has a minimum in the region of 25-30 kg / m 3 . With a decrease in density, as with its increase, the thermal conductivity increases. On the "upper" side, the reason is obvious - this is a decrease in the volume of air in the material. With the "lower" - the reason is that with a decrease in density, the size of gas-filled cavities increases and convective heat transfer increases in them. polystyrene almost does not absorb water: with full prolonged immersion the volumetric water content in the sample does not exceed 2%. This list is rather features that need to be considered when using foam plastic. But one quality deserves separate consideration. It is flammable. There is a real “smoke screen” of false information and ambiguous interpretations around the fire-fighting qualities of foam plastic. Let's try to understand this issue. Polystyrene belongs to the group of combustibility G4 - it is a highly combustible substance. 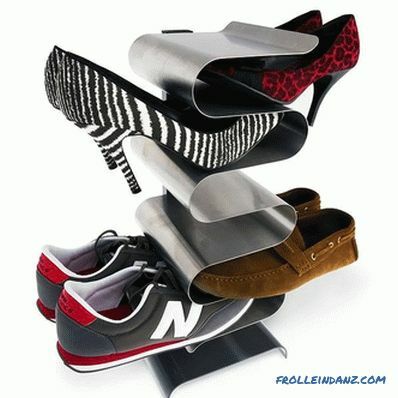 To this group belongs the popular foam brands PSB. Warming of facades with its use is unacceptable. In construction, the so-called non-combustible foam PSB-S (self-extinguishing) is used. In the classification adopted since 2014, it is referred to as PPP. Manufacturers claim that the time of its independent burning (after the cessation of the external fire) does not exceed 4 s. And this is consistent with GOST 15588-2014. According to GOST, tests are carried out with a sample of 140 * 30 * 10 mm in size, by exposure to it with a torch flame for 4 seconds. The video below shows a truly impressive test of foam with fire. However, in a real situation, things may not be so well.The effect of fire may be longer, the volume and mass of material available for combustion are much larger, which reduces the heat loss from the source of ignition. "Testing fragments of walls with different types of skins and insulation from PSB-S, it was found that such a heater ignites, as a rule, after 3-4 minutes from the start of unilateral heat exposure in the mode of "standard" fire, after which it takes place with the burning of fire through the insulation inside the structures.The burning and decomposition of polystyrene in the wall panels was accompanied by the formation of water, abundant smoke and toxic products of combustion and continued until the insulation completely burned out, even if the source of thermal effects on the structure was removed. " Attempts to declare PPP grades of polystyrene fire-safe only on the basis of its self-extinguishing in laboratory conditions are not quite convincing. In the GOST itself, only the time of independent burning under clearly defined conditions is indicated, but nothing is said about the combustibility group. But in its determination, different parameters are taken into account, such as the temperature of the flue gases, the formation of burning melt droplets and others. And yet, polystyrene for building insulation can be used, but you should be aware of the potential danger of this material and not neglect measures designed to reduce the fire hazard. With proper construction, even with foam insulation, it is possible to obtain structures with fire class K0 - safe. 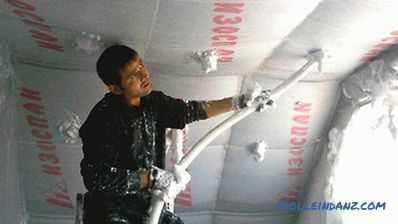 EPS polystyrene is used for insulation of various structures. In facade systems with a thin plaster coating. 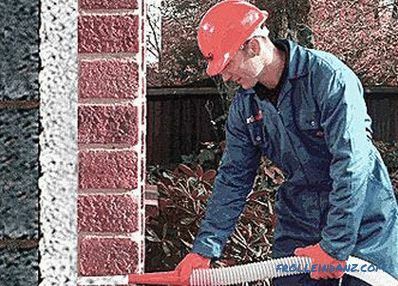 For thermal insulation of floors and flat roofs under a screed, for insulation of floors from impact noise. Everywhere expanded polystyrene is protected by non-combustible materials. 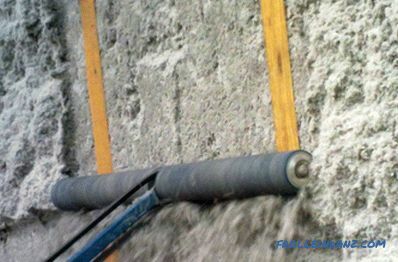 In addition, the vertical insulation of the foam is divided by horizontal belts of non-combustible materials, such as basalt wool. Window openings should also be edged with mineral wool. If the roof or roof system contains combustible materials, then the fire belt is also arranged under the roof eaves. Polyfoam costs 2-4 thousand rubles per cubic meter. This is without taking into account other materials and work on insulation. Extruded Polystyrene Foam (EPS) differs from EPS polystyrene of type EPS by its dense surface and small closed cell structure. resistance to distributed compressive loads and limited resistance to concentrated loads. Due to its low water absorption, the thermal conductivity of the XPS does not decrease even with direct contact with water, and the compressive strength makes it applicable in conditions where it is affected by high loads. 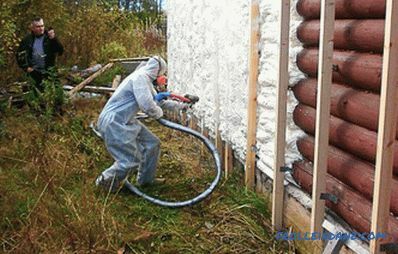 EPPS is used for thermal insulation of basements, foundations, soil near the foundation. It can be laid under the concrete screed. This is the best material for the floor on the ground and on other weak bases. 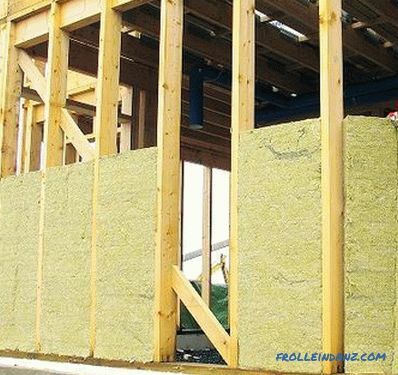 Due to its flammability (G3-G4) and low vapor permeability, EPS does not apply to wall insulation above the base. The price of extruded polystyrene foam is about 4000 rubles per cubic meter. Urea foam is used only in structures that do not create loads on it - in hollow frames and hollow walls. This material is prepared directly on the object, immediately before use. It is poured in liquid form into voids. At the same time, it foams and fills all the available volume.It is important that when expanding and hardening, the liquid foam does not create much pressure on the surrounding surfaces. Due to this, liquid foam can be used not only in rigid structures, but also in frames covered with a soft membrane. Fill with liquid foam and voids in ready-made structures. The cost of urea foam is about 300 rubles per cubic meter along with its preparation and pouring. It is the cheapest material among modern heat insulators. 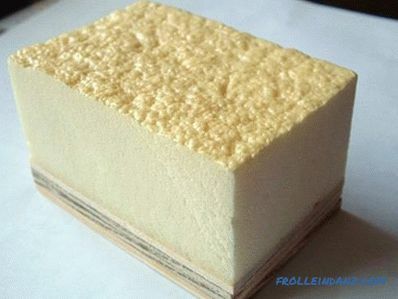 Polyurethane foam (PUF) is a white or yellow foam produced by mixing and interaction of two components of the polyol and polyisocyanate groups. When mixing, the reaction occurs with the formation of plastic mass in the solid phase and a large amount of gaseous products that create a foam, which subsequently solidifies. high adhesion to most materials. Polyurethane foam is divided into two groups - hard and soft. Solids have a density of from 30 to 150 kg / m 3 and compressive strength up to 1000 kPa. The minimum thermal conductivity of materials of this group is 0.026 W / m ∙ K. This is less than that of any other heat insulator, and the figure closely approaches the thermal conductivity of air. Soft polyurethane foams are foam rubber familiar to all. 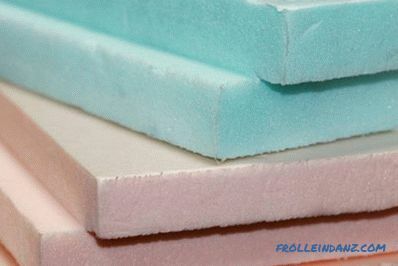 They have a density of from 8 to 30 kg / m 3 and thermal conductivity of 0.03-0.04 W / m ∙ K. Soft polyurethane foam is used in conditions that exclude loads on it, so its strength is not standardized. Polyurethane is flammable, but it does not spread the flame well and is prone to self-extinguishing. Its different brands belong to different combustibility groups - from G4 to G2. Low flammability stamps are obtained by incorporating flame retardants into the composition There is also a G1 PPU, but its real use is still a matter of the future. 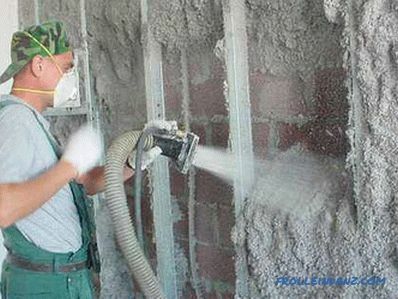 Solid foam is applied by spraying, soft - by pouring into the cavity. For the facade is used spraying solid "foam", followed by plastering. The spraying of polyurethane foam provides seamless thermal insulation that does not have fasteners and a frame that serve as cold conductors. The plaster protects the insulation from sunlight, atmospheric moisture and improves fire safety at home. Spray can easily cover even a complex surface. The photo below shows how the owner of the log house preferred thermal efficiency to inter-heater insulation and authentic exterior of the hut. 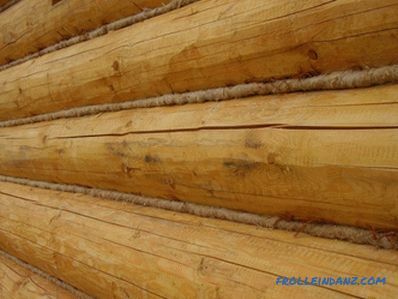 However, in this application, you should take into account the low vapor permeability of the foam and make sure that the wooden walls do not accumulate moisture. Special equipment is used to apply polyurethane foam. To work with it, you need eye protection, respiratory and special clothing. After curing, the material becomes neutral and completely safe. It does not damage rodents, insects, bacteria and fungi. The only serious disadvantage of PPU for insulation is the high price. A cubic meter of "foam" is 1.5 - 3 times more expensive than a cube of foam. In reality, the difference is somewhat smaller due to the high thermal efficiency of polyurethane foam and the adaptability of its application. But still it is large enough. Mineral wool is made from fibers that are formed from a melt of glass or basalt. Fibers are bonded with phenol-formaldehyde resins. 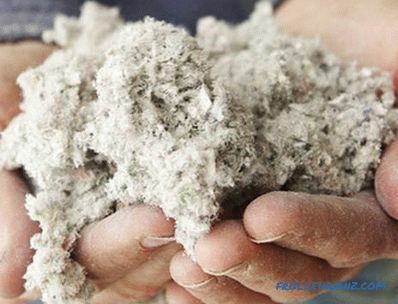 Mineral wool does not burn, but is destroyed by heat due to the destruction of the binder. Density of different brands of cotton varies from 11 to 150 kg / m 3 . The thermal conductivity is in the range of 0.036 to 0.044 W / (m · K). 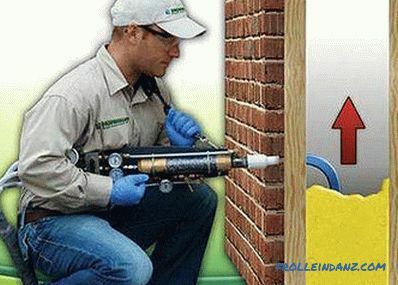 Mineral wool is not subject to rotting, insects are not interested in it, but rodents can spoil the insulation. 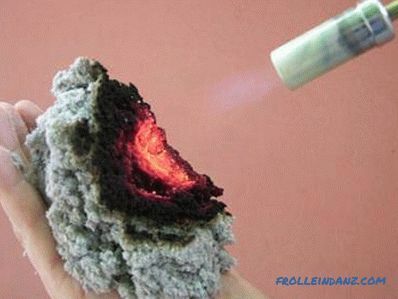 The main parameters of basalt wool are thermal conductivity and density. Moreover, it is precisely the density of the plate that determines the method of its application. For frame structures in which the insulation is not under stress, light plates or rolls with a density of up to 50 kg / m 3 are used. This insulation for the attic, for walls, for floors on the logs. Thermal insulation for a roof with a ventilated layer is performed with mandatory moisture protection, which prevents condensate that forms on the roof from getting onto the wool. High-density boards - 120-140 kg / m 3 are used for warming the flat roof, as operated, and not exploited. 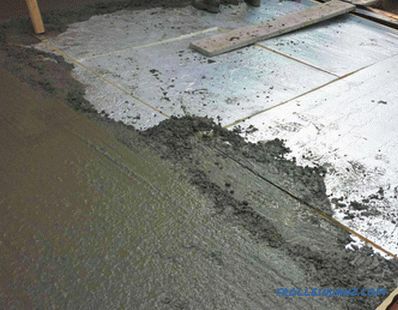 They can also insulate the floor using the "floating screed on insulation" method. This is the name of a cellulose fiber insulation.Ecowool is made from waste paper and textile industry. In appearance and properties, this material is in fact very similar to cotton wool - the same soft and fluffy mass. 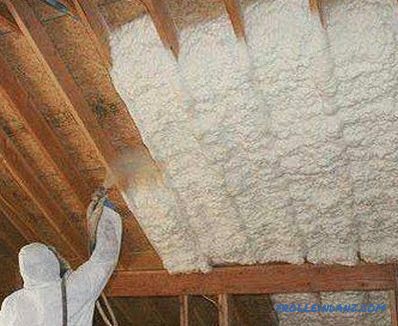 It is this “fluffiness” that gives ecowool thermal insulation properties. And its treatment with antiseptics and fire retardants gives biological stability and prevents its burning. vapor permeability - 0.3 mg / m · h · Pa.
Ecowool is used in building structures that do not create loads on it. These are hollow floors and ceilings, frame walls, curtain walls. It is used in dry or wet form. The dry method is filling the void with a loose fibrous mass with the help of a stream of air. This is how horizontal and vertical structures are filled. For vertical structures, an already assembled skin is required. Filling with a heater is made through openings in it. In the wet mode, ecowool is applied by spraying into open frames on one side. In this method, the fibrous mass adheres to the surfaces and is retained on them after drying. After the application, the insulation leveling and the final installation of the casing are performed. Ecowool manufacturers claim that it is completely safe and does not emit any harmful substances. But given the fact that insulation is usually done outside, this characteristic is not decisive. More importantly, cellulosic fibers freely pass through large volumes of water vapor without condensing it. Ecowool does not require vapor protection, as for other materials. The cost of ecowool along with its installation, depending on the method of application and the nature of the insulated structures, ranges from 1,600 to 3,200 rubles per cubic meter. economic considerations and availability of materials and technologies in specific conditions. Brick, and especially concrete, has low vapor permeability. For the facade of these materials, you can use foam, polyurethane foam, and in some cases - extruded polystyrene foam. Warming is done in a “wet” way with fastening the plates with glue and dowels, followed by plastering along the reinforcing mesh. Low vapor permeability of the foam can create conditions for the accumulation of moisture in the wall. This can be avoided by applying for interior decoration of materials with limited vapor permeability - cement-sand plaster, vinyl wallpaper, special vapor-protective film, mounted under the false gypsum board. Another way to avoid moisture is to use mineral wool for insulation. It is mounted under plaster or with a ventilated facade.For plastering need to apply special formulations with high vapor permeability. The best results are given by the ventilated facade. 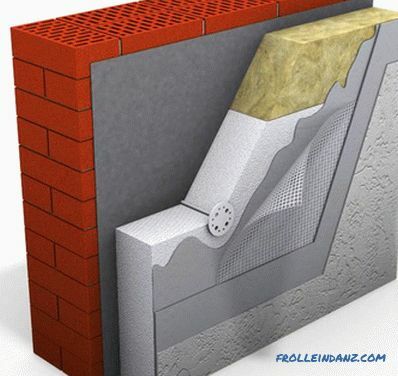 The constant flow through the air layer intensively carries away moisture and contributes to the drainage of the wall. For the facade with a ventilated interlayer, light basalt cotton wool with a density of 25 - 50 kg / m 3 or mineral wool plates with a density of 50-100 kg / m 3 is used. 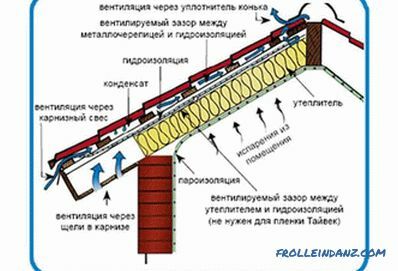 A light-winding membrane is mounted above the light wool, which inhibits transverse air flow and prevents "heat blowing" from the insulation. Dense mineral wool does not need wind protection. Refusal of the windproof membrane improves the removal of moisture from the insulation, even with its increased density. Especially for this solution, medium density plates with a compacted outer layer are produced. 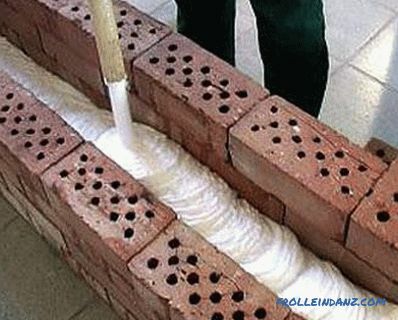 Foam concrete or aerated concrete have high vapor permeability. Because of this, water vapor diffusing from the inside to the outside easily reaches the cold layers, where a condensation region occurs. In a heat-insulated wall, condensation occurs on the outer border of foam concrete or in a layer of insulation, depending on its vapor permeability. Such walls are better insulated with permeable materials - mineral wool, preferably with an air gap. Good results are obtained with a hinged ventilated facade with warming from carbamide foam or ecowool. These materials are least susceptible to moisture condensation in them. These walls are very sensitive to moisture. They should be warmed only with permeable materials with an air gap and not to neglect internal vapor protection. For them, you can use basalt cotton wool, ecowool, liquid foam. 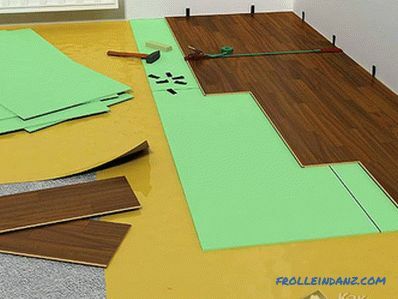 When insulating floors, there is usually no question of their permeability to steam. The exception is the ceiling under the unheated attic. The peculiarity of insulation of floors and floors is the susceptibility of insulation to compression loads. Therefore, appropriate materials are selected for them - foam plastic, EPPS, mineral wool with a density of 120 kg / m 3 and higher. it is better to choose EPPS that are insensitive to warm the floor on the ground or above a damp basement to moisture. For frameworks: for roofing or flooring, the attic or wall is characterized by the absence of massive materials. Virtually the entire barrier to heat and cold is created by insulating the filling of the frame. This changes the solution to the problem of how thick the insulator should be. For the climate of Moscow, mineral wool is needed at least 125 mm. 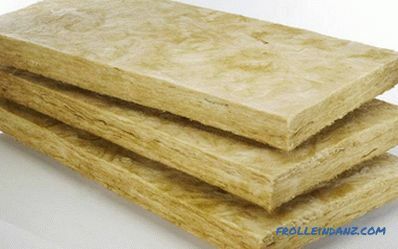 It is mineral wool that is most commonly used in such constructions. Styrofoam inapplicable due to flammability. Ecowool can be used. It has a higher insulating quality and the probability of condensation in it is less. 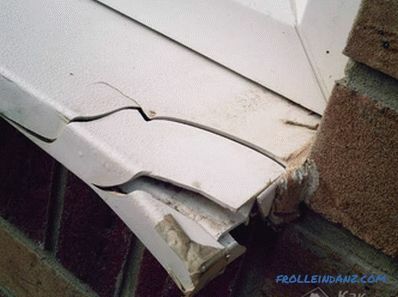 Condensate is a serious problem for frame walling. Therefore, they should definitely use a vapor barrier and it is better to give preference to a ventilated lining. In the case of mineral wool, a thick slab without a windproof membrane is less susceptible to wetting. Minimum literacy will help to navigate in the choice of insulation and the technology of its application. But for each particular case, it is necessary to competently evaluate the conditions of use of the house and make recommendations based on accurate calculations.